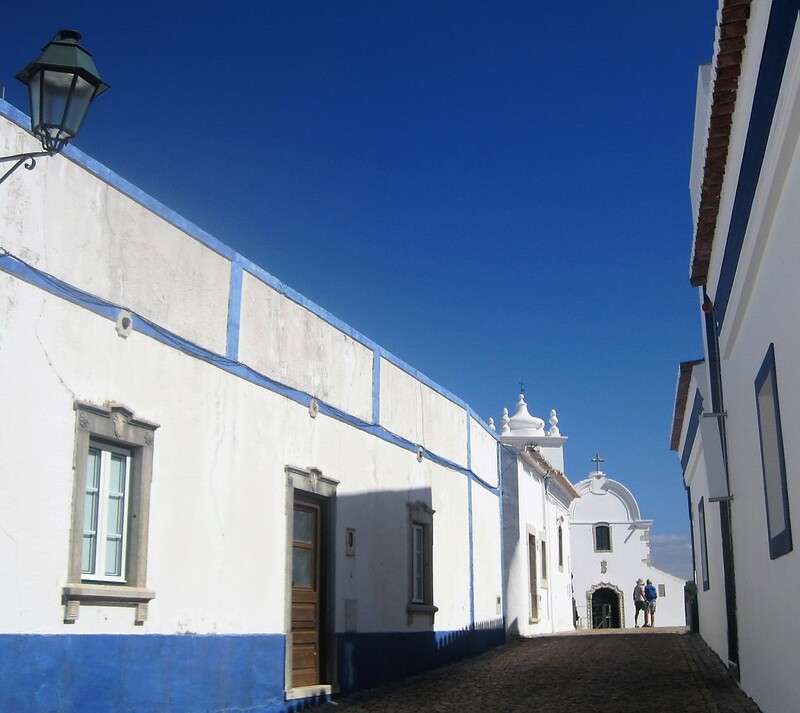 Another of the Algarve’s sleepy villages, Querenca was looking idyllic on the last day of my October holiday. Our walking group were meeting at the cafe on the left of the photo above. It’s quite a drive up into the hills and a ‘bica’ of coffee is always appreciated before we start walking. 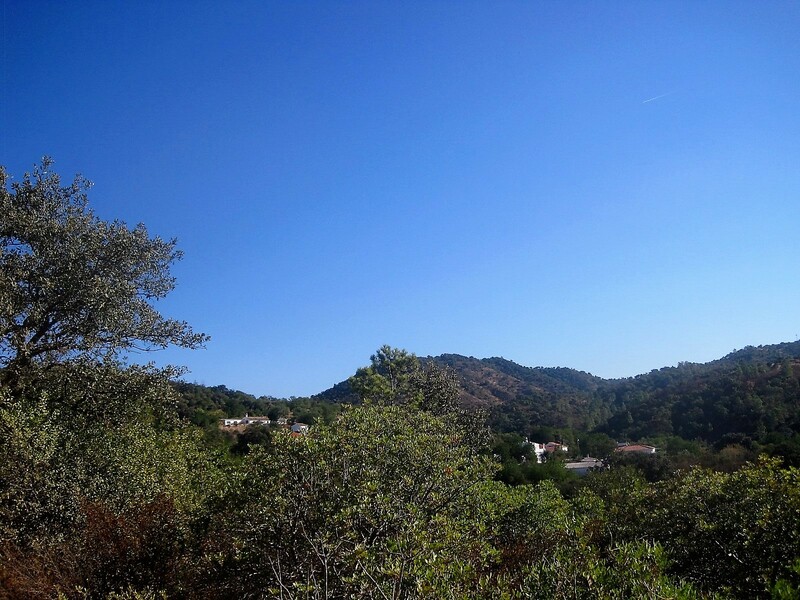 Surrounded by rolling hills and leafy green scenery, Querenca breathes pure tranquillity. Excepting when the Festa das Chouricas takes place, at the end of January, and the waft of spicy sausage rouses the locals. In honour of St. Luis, the patron saint of animals, the celebrations give thanks for the pigs, bred locally, that feed the villagers throughout the year. I rather fancy trying chouriço à bombeiro, where the sausage is doused in brandy and set alight. Bombeiros are fire fighters, in case you wondered. Time to set forth. We leave the village square in a downhill direction, over lovingly worn cobbles. I’m too busy admiring the scenery to realise that the return route could well be steeply uphill. There are 13.7 kilometres to cover first. I’ve walked to Fonte de Benemola in the past, but this route is unfamiliar. Portuguese street names do sometimes seen inordinately long. And did you notice that cat, giving me such a baleful look? Continuing downhill we find the beginning of the trail to the Fonte, or spring. A lush green valley leads beneath lofty cliffs, the arid red of the Algarve soil revealed in the fissures. It reminds me greatly of my trip to Rocha da Pena, but today the weather is impeccable. The trail winds along dustily, and becomes quite rock strewn in places. In Spring these nooks and crannies will be dressed in the finery of rock roses and lavender, with the promise of wild orchids. This late in the year colour is harder to find. When finally I reach the Fonte, the bamboo and rushes are bleached almost colourless. A soft shushing noise betrays the presence of the water, a sign ‘olho’ pointing hopefully. A young couple are balanced on the rocks, trying to capture on camera the bubble of water as it rises and swirls in an ‘eye’. I carry on, knowing that I’ve seen it in far less parched surroundings. These natural springs prevail throughout Portugal’s hills. This is ‘the eye’ in Springtime. As we follow signs back to the village I wonder if the cheery basket maker is still there, with his whistles and bird imitators. I had purchased a wicker bowl last time, feeling sorry for him as he sat alone in the woods. It serves as a slightly wonky erstwhile fruit bowl. Many new arrivals are enjoying the unseasonally hot weather, and I feel sure that he will be enjoying good trade in his shady dell. Remember that climb back into the village? I confess I had forgotten all about it. It took a while before I was puffing and panting back into the village square. There just has to be a reward, don’t you think? Much later I discovered a video of the Fonte that I thought you might like to see. 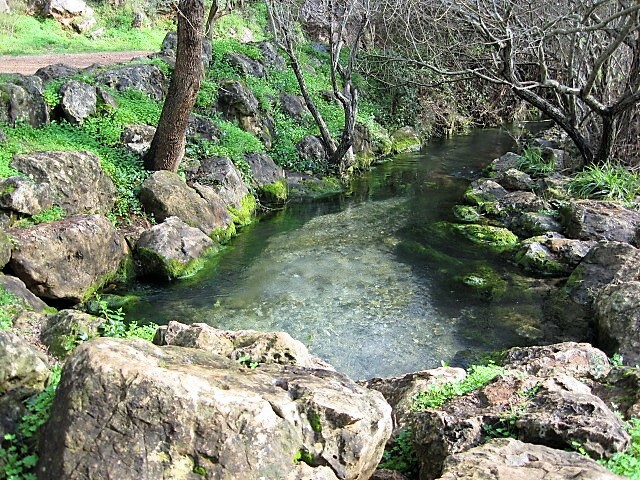 There are a number of routes around the natural springs. 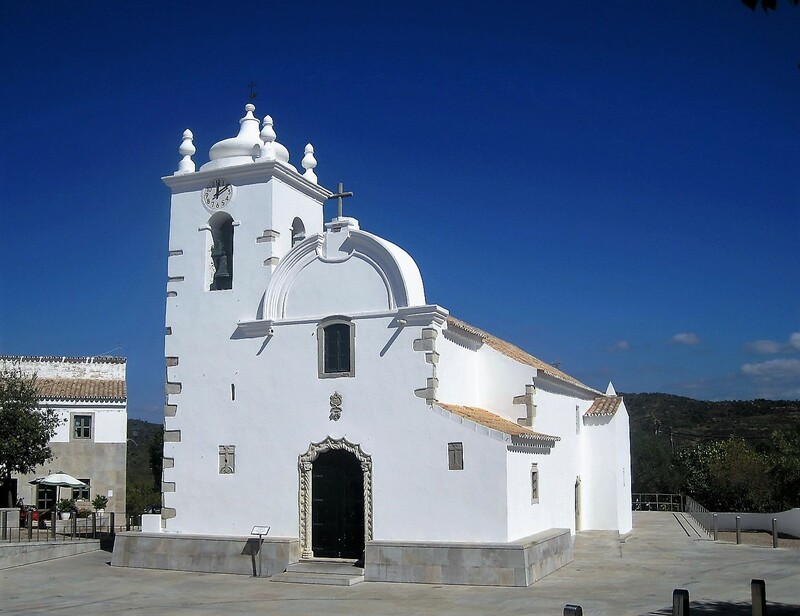 Walking Trails of the Algarve pages 76 and 80 will give you shorter variations on this walk, or you can simply follow the signboards. This video will give you a glimpse of the basket maker. Please ignore the advertising. I hope you’ve got the kettle on, ready to join my walkers from your armchair? Thanks so much, everybody, for your kind contributions to my walks. I wasn’t at all sure where to lead you this week but in the end I opted for sunshine, as Winter wraps itself around us here in the UK. I hope you enjoyed it. If you’d like to contribute anytime the details are on my Jo’s Monday walk page. Just click on the logo above. Jackie’s by the York River, in Yorktown. Virginia, of course! Nothing like a good fumble around the Albert Docks with Drake. He’s in his element! Becky’s counting to 6 this week, but there are lots more than that! While Carol’s fossil hunting and has found loads! That’s it for now. I think I’ll be walking in the UK again next week. Feel free to join me but, more importantly, take care till then. Hi sweetheart 🙂 I haven’t quite thrown myself into the madness of Christmas yet, and ours will be very quiet this year. Just a few meals out with friends alongside the traditional stuff. Slow down! You’ll still get there 🙂 🙂 Take care of yourself! I have to admit they’re not my favorite, either. I’ve been attacked one too many times. Have a lovely start to the month of December! what a charming and peaceful village, Jo! is the white building a church? so beautiful! i enjoyed the video of all the natural springs! so refreshing! what a lovely walk! thank you. Love those white buildings. It’s been pouring here for two days straight so it was nice to read such a bright and cheery post! We’ve definitely hit changeable time of year, Corey. I think they’ve had their share of rain in Portugal too, but it was much needed. 🙂 Thanks for your company. Sometimes a post needs a little something extra (apart from the naughty cake 🙂 ). Thanks, Amy!